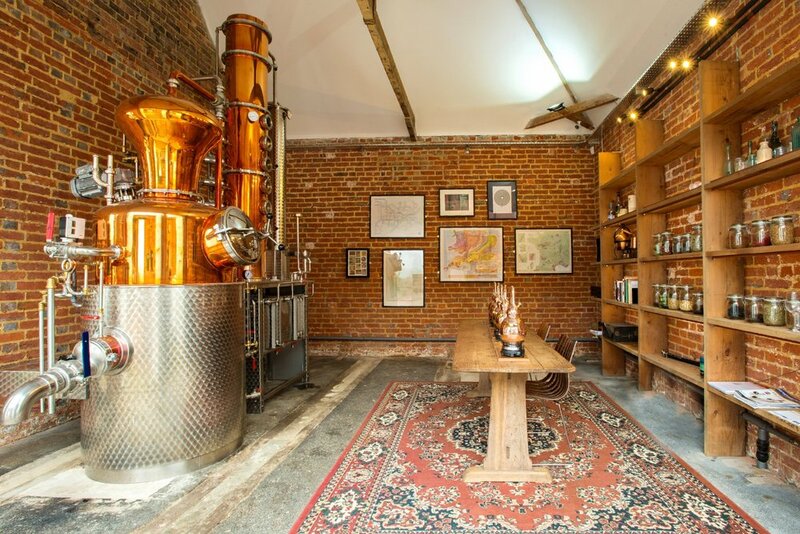 An intimate distillery experience where you'll enjoy a cocktail while you tour the distillery, you'll learn about the art of distilling and the different gin botanicals and how they are combined, and then you'll distill your own full bottle of gin on an individual copper pot still, selecting from our range of over 40 botanicals. The Greensand Ridge Gin Experience takes you on a journey from the origins of distilling to taking home your own handmade 700ml bottle of Gin. An ideal gift for that spirit lover in your life, or shared experience for you and a friend. Over the course of two and a half hours, you will learn all there is to know about gin distillation. On arrival, you'll relax with a tea or coffee while you hear about the history of distilling and the role of botanicals, you'll then select your own botanicals with assistance from our head distiller, and then enjoy a complementary Gin and Tonic while you distil your bottle. You'll operate your own individual copper pot still, or for only an additional £25 you can share your still with a friend. Our six mini stills mean that small group sizes make it a really intimate atmosphere. Simply use the form below to book one of the available dates and we will post a booking confirmation to you. For a shared experience you need to book one spot (add the extra person to your spot where indicated on the booking form). Alternatively, buy a voucher for a gift or to book at a later date. If you'd like a nice hardcopy voucher to gift, please remember to give us your address during the booking process. Please note that gift vouchers should be used to book an event within 1 year and bookings cannot be cancelled or exchanged within 10 days of the event. When do you run the events? We usually run the events on Thursday evenings, Friday late morning and Saturday afternoon, however we do sometimes alter this scheule and add in Friday evening or Sunday sessions. To see the current dates, look through the calendar above, and click on dates in bold to see timings for those days. Only events which have spaces available are displayed on the calendar so the first dates that show will be the first ones with space available. We add dates about 3 months in advance, so check back if you want dates more then a few months out. No Problem. You just missed the check box to add your guest before selecting a date. Your space is all booked in and we'll see you have a booking for 2 when you come. Should I get a taxi? We serve a small gin a tonic while you are distilling, but the events are not boozy, so you should be fine to drive unless you have a zero tolerance approach. We send out a map in the confirmation email, and a hard copy map in the post. The day before your visit you'll receive a reminder email with the map and a navigation link so you should get here just fine, though we are a little hard to find. Just don't follow the Google map location! If you don't have a shared experience we can always add a guest on the day, so yes, but there are a maximum number of 1 additional guest per ticket. There's 1/2/3 of us, how many spots do I need? For one or two guests (as a shared experience) you will need one spot. For three guests, you will need two spots (one single and one shared) or three spots if you all want a still to yourselves. I can't make my original date, can I rebook? Sure. In your confirmation email there is a link to change your date. We can't accept any date changes within 10 days of your booked event. I can't come to the event tomorrow. Can i get a refund? If you can't make it at late notice and we are able to fill the space then we will happily refund you the cost.